Adeo Ressi, CEO of the Founder Institute, speaking to a groups of stakeholders in an annual planning meeting. This post was written by Adeo Ressi, CEO of the Founder Institute, the world’s premier startup launch program for talented entrepreneurs. Annual planning is a necessary endeavor, particularly for a startup. If you do not know what you want and where you are going, then you will never reach your potential. With that said, it’s often very easy to make mistakes when planning that can cause you to lose your way. You can be too aggressive, too conservative, too dictatorial, etc. Here is the process that I use, which may help in your planning journey. I take copious notes during the interviews, and I often brainstorm alongside the stakeholders, riffing ideas off one another. This can definitely be one of the funnest parts of the planning process, where you get to openly brainstorm with people that you may not normally brainstorm with. During the brainstorming, I push people to propose any idea, no matter how crazy, although we may not be able to execute them all in the coming year. I also try to categorize the ideas that are discussed as the discussions are ongoing to make organizing my thoughts easier, which I will outline next. No matter how complicated or layered your annual plan is, there is normally some underlying thesis or principle that unites vision, especially in a startup. I like to reflect upon the various conversations and many ideas, synthesizing them into one rallying cry for the year. You may feel compelled to rush this phase, but taking the time to reflect and be patient is very important. Here is what normally works for me. To start, I like to take all of the notes that I collected from speaking with stakeholders and organize them into categories, which can be structured around business lines or activities. It’s helpful if you do some organizing during the conversations with stakeholders. I then break the categories into high-level projects, which I finally organize by priority. Prioritizing can be pretty easy if you speak with a lot of stakeholders, as you will hear certain ideas over and over again, and the projects related to these common ideas take priority. When I have these prioritized list of initial projects, the plan is still very rough. At this point, the rough plan is good enough to identify some theme that runs through most of the projects, but not all. Common themes relate to growth, engagement, quality revenue and profitability. It may take some time to see the theme, which is why it important to reflect in this phase. If you are impatient, like me, then what I do is start working on some of the projects concurrently to try and experience firsthand what the theme is. Once the theme for the year becomes apparent, I like to coin a rallying cry. The rallying cry captures the theme and translates it into something that your various stakeholders can support. Historically, I have chosen either very literal rallying cries or more abstract ones. For example, in 2017, our rallying cry was literal, “break even on course fees.” The business has historically been break even across a number of business lines, but we wanted to be break even on the primary revenue source to ensure that we could survive in any economic climate. 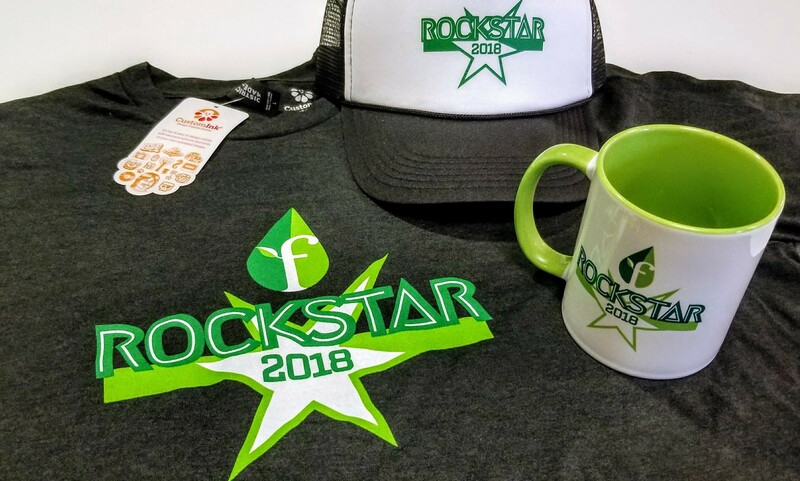 In 2018, our rallying cry is more abstract, “Rockstars.” The idea here is that we want to help everyone in our network realize their potential to become a Rockstar, which is an internal term that parodies the popular ‘startup rockstar’ terminology. We even made schwag to commemorate the theme. Schwag was produced in 2017 for an annual plan about 2018 based on the theme for the year. Once I have the organizing theme for the year and rough prioritized projects, I like to identify three to five measurable goals. Setting the right goals requires a process. The goals themselves need to support the theme for the year, so that, if the goals come true, then the theme for the year will be realized. Each goal should be assignable to a team member, vendor or group, so I normally collaborate on the goal and the measurable targets. Here is where things can get a little tricky. As a leader or CEO, your job is to be ambitious and to push the organization. Normally, it is pretty easy to identify the goals themselves, but the measurable targets is where conflict arises. Almost every planning cycle begins with me setting goals that have measurable targets with a 2–3x growth rate over the year. Then, I start meeting with the respective team members, and the compromise process begins. I start by creating a master annual planning document with the theme (“Annual Plan”), the goals and the various rough projects that I have identified I also include all of the notes from the stakeholder meetings. I share this document with the various team members and stakeholders that are required to execute on the goals, and set-up a series of three one hour meetings to discuss the goals. During the meetings, we go through the goals one by one, and there are often frustrating debates. What I have found is that you can normally postpone discussing a particularly contentious goal and move to the next goal, and then you will find a solution. For example, one goal may be to double your users and another goal would be to increase the revenue per user. By stopping a debate on one goal and reviewing both goals, then you may just decide to get less than double the users, but increase revenues more than you projected as a compromise. We can normally get the process done in less than three meetings, and, as soon as it is done, we are done. If you have a good team and supportive stakeholders, the process will work. In many ways, the real “work” begins when you take the goals and the initial projects and you start breaking them into real plans. For each goal, we generally produce at least one planning document. To put things into perspective, in 2018, we produced at least 17 related planning documents that were linked off of the main Annual Plan document in Google Docs. To ensure that the process runs smoothly, I will start drafting a rough outline for each of the plans based on the goals. Then, I will organize meetings with and among the team members to finalize the plans. Generally speaking, these planning documents break down into two categories, processes and specifications. On the process side, growth will either break existing processes or require new ways of doing things. Processes can be tricky to design, as they usually involve refactoring team members, changing the organization and redoing legal frameworks. I like to design the processes with as many team members as possible to ensure buy-in, and then it is often as important to think about how to communicate the new process to the team as it is to design the process. On the specification side, growth will usually require new technology, and there are often more technology projects than there is time. Priorities are therefore very important, and they are driven off of the goals. If the technology does not support our main goals, then it gets deprioritized. Once prioritized, we look at what must be done first in order for us to hit our goals as quickly as possible, and sequence out these projects for the first and second quarters. We then make a very rough technology plan for Q3 and Q4, and we start drafting the specifications for the first couple of initiatives. We generally run all of our actionable plans in an “experiment” framework. So, whenever possible we look at ways to test the processes or the technology, measure the results and then roll out (or roll back) the plan. We describe the tests in the planning documents, which normally resembles a phased roll out across the four quarters of the year. We are also very careful to think about how to properly test new technology or processes with a “representative sample.” Good input data leads to good conclusions. The planning documents can become very detailed, often including data, extensive research, template emails and even new legal language. It is human nature to create mental models for how things work, and oftentimes when you are trying to grow, your mental models are flawed or wrong. I frequently will study data and patterns with team members when putting together these plans, and I will consciously work on refining or even rebuilding my mental models to reflect the reality represented in the data. Measuring a plan’s progress, collecting experiment results and analyzing operational data is the last part of my annual planning process, and, in many ways, it is the most important. Obviously, you will not even know if you succeeded unless you track the results. There are three components to our tracking that I use: calendars, dashboards and meetings. This is an outline of the calendar for a particular actionable plan that was later digitized and expanded. For each of the major measurable goals, we produce a quarterly calendar of key milestones. Normally, there is a logical sequencing of the milestones. So, for example, we plan to run a series of customer acquisition experiments in Q1 before finalizing the customer acquisition strategy in Q2. These milestones will often resemble a Gantt chart, with certain milestones spanning multiple quarters. By the middle of the year, we try to either hit the measurable goal or have an almost certain likelihood of hitting the goal by the end of the year, roughly at the end of the second quarter. This allows us enough time to course correct if there is a problem. All of the team members own a piece of the measurable goals through the process to develop an actionable plan, and it’s important that the whole team sees their individual and collective progress. To this end, we build and continuously refine a series of online dashboards to track all of the goals. Remember, they don’t need to be pretty. Often, the dashboard we release will just show the goal, the name of the owner and some longitudinal data, helping the owner evaluate their progress over time. At our scale, all of the reports owned by each team member are consolidated into one dashboard that we review in the weekly staff meeting as a group, helping to review progress, address issues and keep everyone accountable. The final way that we keep everyone accountable is to set up weekly, bi-weekly and monthly meetings related to the goals and plans. We have two types of meetings: collaborative (Collab) and strategic (Strat). The collaborative meetings are designed to share status updates and assign action items with the purpose of hitting the measurable goal. If any individual item takes longer than a few minutes in a Collab meeting, then it needs to be moved into a different meeting. The Strat meetings are designed for team members to discuss and brainstorm solutions to more complex problems or opportunities, and the meetings are run more like brainstorming sessions. Keep in mind that a good annual plan will take a couple weeks or more to complete properly. In many years, I finish the plan in January, so it is never too late to start. It will also take approximately 15 to 30 hours per week to complete well. So, you can assume at least 30 hours worth of work. A lot of the work is taking time to reflect, which happens across five phases. When you know where you are going and what you want to accomplish, a motivated team can achieve anything. A good annual planning process can align all of the business stakeholders around a common direction for the company. More importantly, it can help to engage and motivate the entire team, and keep everyone focused on the desired results. It is never too late to start planning. Join our newsletter to get even more exclusive startup tips, videos, and more!